Shop online for over 1,100 aires plastic models at discounts up to 50%. This is the 1/48 Scale F/A18 Hornet Radar Antenna For KIN from Aires Hobby. This is the 1/48 Scale P51D Cockpit Set For a Tamiya Model From Aires Hobby Models. This is the 1/48 Scale P51D Detail Set w/Packard-Merlin V1650 Engine For a Tamiya Model From Aires Hobby Models. 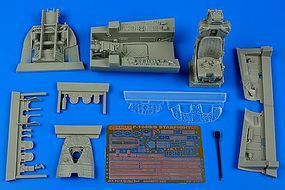 This is the 1/32 Scale F100D Cockpit Set For a Trumpeter Model From Aires Hobby Models. This is the 1/48 Scale F/A18E/F Super Hornet Exhaust Nozzles Opened For HSG Plastic Model Aircraft Accessory by Aires Hobby. This is the 1/32 Scale F104G Starfighter Cockpit Set For ITA Plastic Model Aircraft Accessory by Aires Hobby. This is the 1/48 Scale F15E Exhaust Nozzles (2) For Revell & Hasegawa From Aires Hobby Models. This is the 1/48 Scale P51D Mustang Wheel Bay (Resin) for a Tamiya Model From Aires Hobby Models. This is the 1/48 Scale Wright R1820 Cyclone Engine From Aires Hobby Models. This is the 1/48 Scale Aces II F16 Ejection Seats From Aires Hobby Models. This is the 1/32 scale R2800 Early Engine from Aires. This is the 1/48 Scale EA6B ICAP2 Late Cockpit Set For a Revell Model From Aires Hobby Models. This is the 1/32 Scale F100D Super Sabre Detail Set For a Trumpeter Model From Aires Hobby Models. This is the 1/72 Scale F4U1 Corsair Flaps (Resin) for a Tamiya Model From Aires Hobby Models. 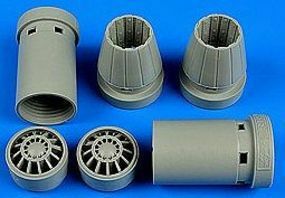 This is the 1/48 Scale F16C Wheel Bays For a Tamiya Model From Aires Hobby Models. 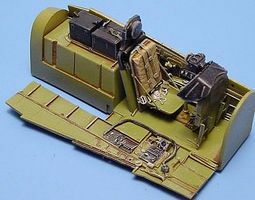 This is the 1/48 Scale FGR1 Cockpit Set For a Hasegawa Model From Aires Hobby Models. 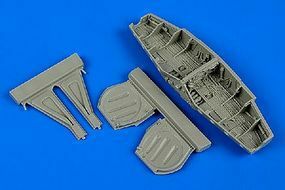 This is the 1/32 Scale A7E Corsair II Late Detail Set For TSM Plastic Model Aircraft Accessory by Aires Hobby. This is the 1/32 Scale F8 Crusader Exhaust Nozzle For a Trumpeter Model From Aires Hobby Models. This is the 1/32 scale F16C Cockpit Set For an Academy Model. This is the 1/32 Scale F/A18E/F Exhaust Nozzles Closed For a Trumpeter Model (Resin) From Aires Hobby Models.